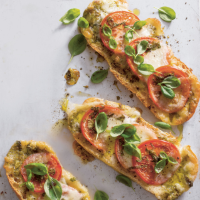 Quick and easy to make, these simple pizzas use ciabatta bread as a base. They can be ready to eat in under 30 minutes. Preheat the oven to 200°C, gas mark 6. Place the ciabatta halves, cut-side up, on baking tray and spread with the pesto. Sprinkle over half of the shredded basil. Alternate tomato and mozzarella slices on top, season and sprinkle with the remaining shredded basil. Bake for 20 minutes until golden. Scatter over the basil leaves to serve. This recipe was first published in Wed Mar 11 15:11:46 GMT 2015.